Think fast! Team up in this fun, fast-paced game and rack your brain for items that fit the category. Can you think of articles of clothing, things you fold, or things at the beach that start with S? You score points when you come up with things that no one else does. But you’ve only got seconds to come up with them! The more creative your answers, the more points you score! 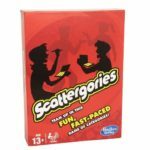 Scattergories and all related characters are trademarks of Hasbro. • Ages 13 and up. • For 2 to 4 teams.